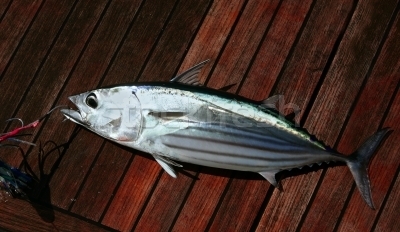 Skipjack Tunas are medium sized species highlighted with black colored stripes. They are found to habitat in the parts of World Ocean and have attained so much popularity that it has even rocked the market of Tuna. These fishes are marketed in the form of canned, salted, fresh and smoked. These species are cannibalistic by nature and prefer to float around the place. One can spot these species in the meeting point of the warm & cold water. These species are light and marketed in a canned form with a calories and carbohydrate content that is very less and hence desirable. They are also popular because they contain a lot of protein and minerals and despite their weight; their size is three times bigger than that of an egg. 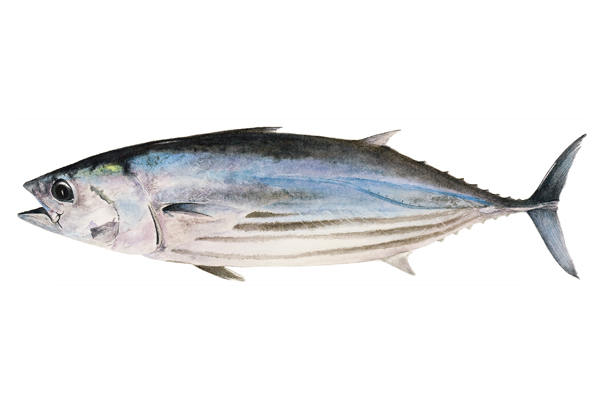 Skipjack Tunas are commonly found in the sub tropical and tropical areas. They are found spread along the South Tropical Atlantic right up to Argentina, Europe through North Sea. Moreover, these species tend to move from one place to another place. This includes regions of Pacific, Atlantic and Indian Ocean. These species can be spotted floating around the whales or sharks. Length of Skipjack Tuna: The size of these species is 1 m.
Weight of Skipjack Tuna: The weight of Skipjack Tuna hovers around 18 kg. 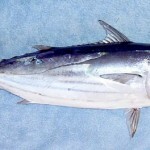 Shape of Skipjack Tuna: The body of these fishes is spindle shaped. It has a lot of scales with two dorsal fins out of which one has spines while the other is without spines. There are some finlets that uses the second dorsal .They also have three keels. 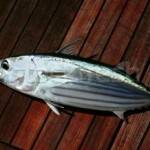 Color of Skipjack Tuna: They have silver colored flank and stomach. The back is deep blue purple colored that also has a dark line covering the corselet right up to the tail. These species like to have mollusks, fishes, lantern fish, crustaceans, cephalopods. In addition to this, they also feed on shrimps, squids, herring, small mackerel, anchovies and sardines. They are cannibalistic by nature and like to hunt during the dusk and dawn. One can spot these species in various parts of the Worlds Ocean. Today they have captured the market of Tunas. The rate at which they grow and reproduce helps a lot in the commercial & recreational fishing of the Tunas. These species are mainly sold in the form of frozen and canned tuna. In Japan the dry form of Skipjack Tuna is very common and is called Katsuobushi. These species are very mobile by nature. They inhabit the equatorial water & migrate to the south and north in groups. They float along with the sharks, whales or any other kind of objects. These species are very tasty and have numerous health benefits. They contain a lot of manganese, potassium, vitamin B1 and Vitamin B 6. 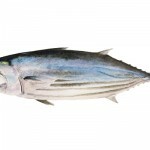 The nutritional effect of Skipjack Tuna primarily raises the omega 3 helpful in maintaining the cardiovascular condition. In fact it helps in resisting cholesterol and maintaining heart functioning thereby diminishing the effects of blood clotting. It is a great source of folic acid and vitamin B6. However, it can reduce the levels of homocysteine that affects the artery walls adversely. These species helps to increase the Heart Variability Rate and thereby chances of strokes. It even helps the women affected with diabetes and children with asthma in a positive fashion. The presence of Omega 3 protects the skin from sun tan. In addition to this, it clears out the body from drugs, compounds and pesticides. These species are also helpful for the digestive tracts and might assist in getting rid of kidney cancer. These species also help one to have a good memory and reduces frustration. One can prepare Macaroni and Tuna salad including macroni, canned tuna, capsicum, and celery and dill seed with Skipjack Tuna. One can also try out tuna pasta with garlic and tomato that includes canned tuna, cooked pasta, garlic, chilly, tomato, kalamatta olives, and chopped parsley. The next one is tuna bean with salad that has cracker pepper, onion, vinegar. An interesting preparation could be tuna salad with spinach that consisting of spinach, tomato, mushrooms, boiled egg and avocado. A tuna penne preparation with ariabiata that has chopped chilly, garlic and chopped anchovy fillets should be refreshing. These species get sexually mature within one year when they attain about 40 cm size. They are known to mate in the equatorial water bodies. The female counterparts generally lay eggs based on their body size. In a year they lay about 2 million eggs. The eggs are generally pelagic and shift to the cooler areas of the water. These species can live for about 7 -12 years. According to the reports of the World Conservation Union Red list these species are not in the category of those endangered. However in the Atlantic Ocean their population has reduced. National Marine Fisheries Service has totally controlled their import.